Les Jardins de Fleurs! People who loves to do selfie or groupie will absolutely fall for this place ehe. Nanny’s have different theme in every outlet, and here they used to be a terrace one. Since me, my lil sister and my lil brother wanna do many selfies, so we decided to sit inside. Well, we were really lucky because we can have a table at the best spot to do that lol. 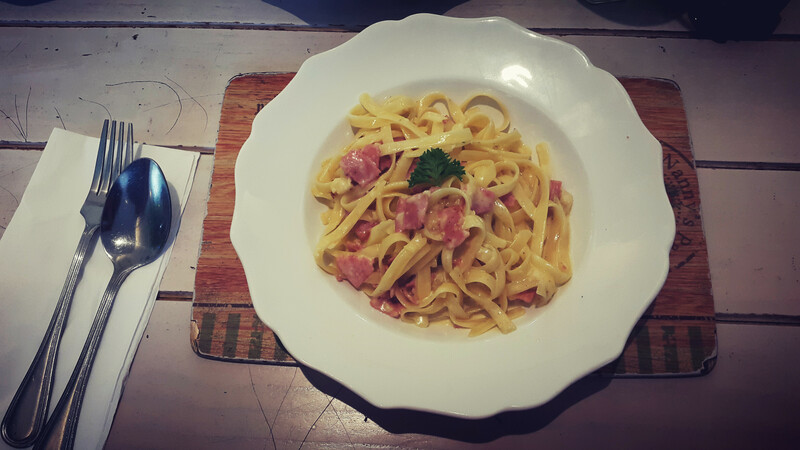 • Fitz’s Carbonara Fettuccini (price around 52k). In my opinion, if you want to order main food here you have to be a kind of person who love cheese so much. They are not stingy at giving topping, specially cheese lol. But the taste is quiet delicious tho. 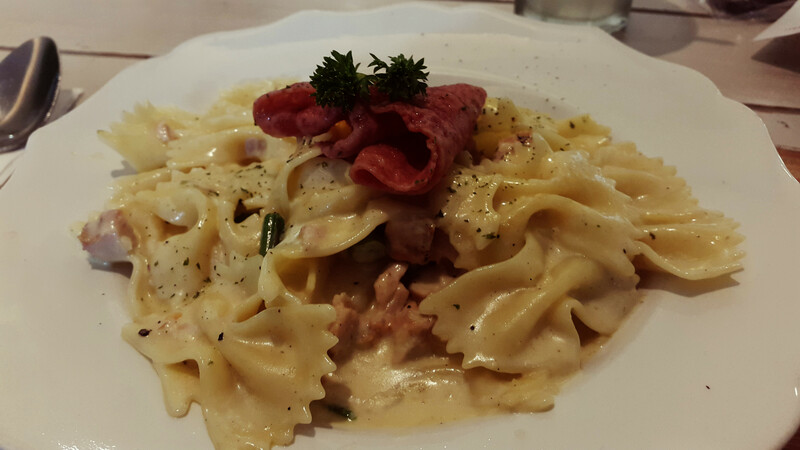 • Leal’s Farfalle Pasta (price around 52k). Since they wrote bacon and chicken as the topping, my expectation was high about the amount of its topping. But then, I realize that their kindness is limited for cheese only. I wish they give the bacon moreee :” At the first time I came here, I taste something weird at its flavor, I thought it is because of the seasoning is mixed with other food. But then I order the same menu, I realize that it is really the taste of this food, ehe. I think this is the cutiest menu here, since the pasta is shaped just like a bow tie. 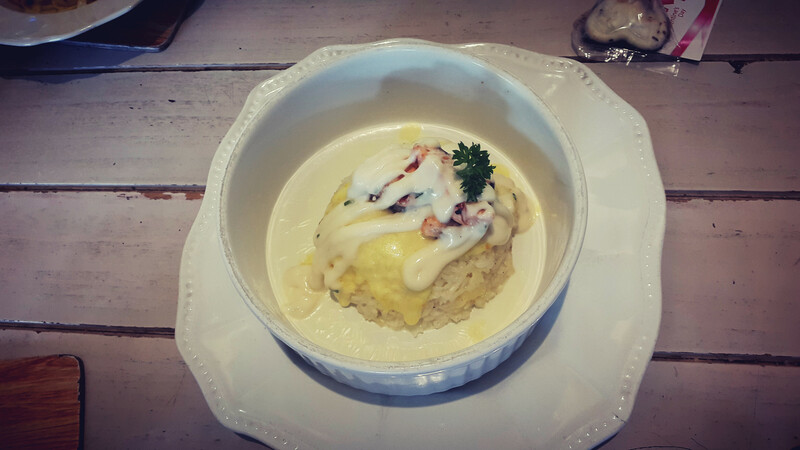 • Cecile’s Salmon Baked Rice (price around 48k). The most delicious menu that I’d order here. Well, blame on my appettite, I just fall for salmon. At first I also think its real portion and the picture will (at least) look alike, but ended with the real one is less much than the picture. • Lemonade Mint (price around 28k). I do love the taste of lemonade and mint become one. It is completely refreshing! Fall for this one actually. • Blueberry Lemonade (price around 28k). My sister said she enjoyed this drink so much. It is sweet and slightly sour, but really drinkable.